Brunettes do it better! 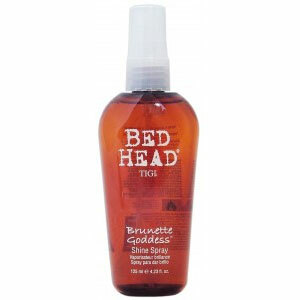 Spray it, shine it, and flaunt it with TIGI Bed Head Brunette Goddess Shine Spray! Add shine to your hair and define your natural or colour-treated highlights for great looking hair. TIGI Bed Head Brunette Goddess Shine Spray will not only leave your hair feeling soft and smooth, but add a shiny and healthy goddess look. This lightweight and non-greasy spray is suitable for any hair length or texture, enhancing your hair�s shine and strength.